Indonesia has raised its Volcano Observatory Notice for Aviation (VONA) to red, its highest warning, saying the cloud of ash could reach more than 6,000 metres into the atmosphere. Authorities say Bali is “still safe” except for a 7.5-kilometre zone around Mount Agung. Some 25,000 people were evacuated from the area in September, when the volcano showed signs of activity for the first times in more than 50 years. The volcano’s last major eruption, in 1963, killed more 1,000 people and wiped out several villages. 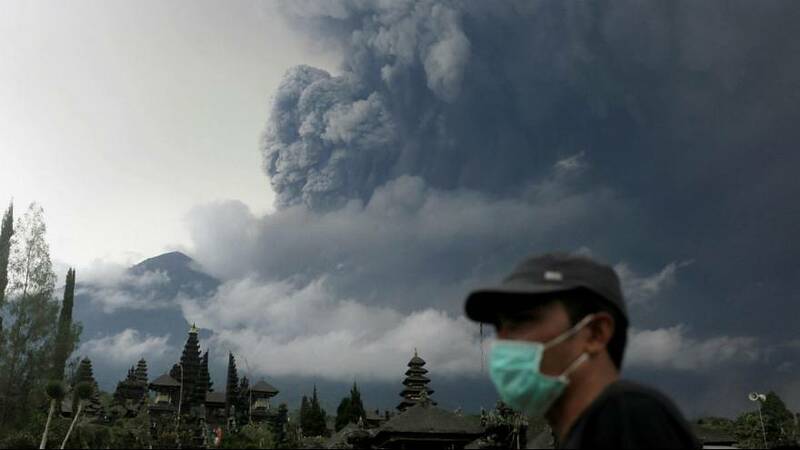 Officials said Bali airport would remain open for now as the ash could be avoided. However airlines have cancelled dozens of flights as a precaution. The ash cloud is thought to be moving eastward towards the island of Lombok, and the main airport there has been closed. The cancellations have so far affected several thousand people, many of them Australian tourists. After resuming flights on Sunday morning, Virgin Australia again canceled flights on Sunday afternoon following a change in the aviation colour code from orange to red.